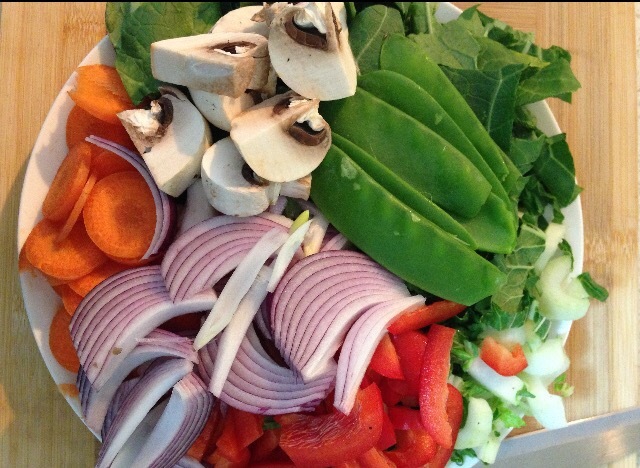 Cut veggies to bite size pieces and separate the harder veggies (onion, carrot, brocoli, bok choy steams, cauliflower, etc) from the veggies that take less time to cook (mushrooms, baby corn, bok choy leaves, capsicum etc). Add in chicken, coconut cream and rest of the veggies and allow to simmer for 5 minutes or until chicken is cooked and greens are cooked but still crunchy. *I use peanut oil as it withstands high temperatures and it doesn’t have a strong flavour. Any other oil is fine. **You can generally buy May Ploy curry paste in single use pouches in the supermarket or from an Asian grocer. A whole tub is around $5 and you will get at least 10 curries from it. We mix it up depending on how I am feeling as to what we serve the curry with. Jasmine or brown rice, cauliflower rice or just the curry as is. If we are short on time I put jasmine rice in a big microwave safe bowl in the microwave (rinse rice then 1 cup rice to 1 2/3 cups water) and microwave for 12 mins. I check it and if needed cook for another 1-3 mins. If I do this first then by the time the rice has finished then the curry is ready. Faster than any takeaway! !